The first Mayor’s Court was established in the Presidency Town of Calcutta in 1728 that started functioning at the Ambassador House belonging to the East India Company. 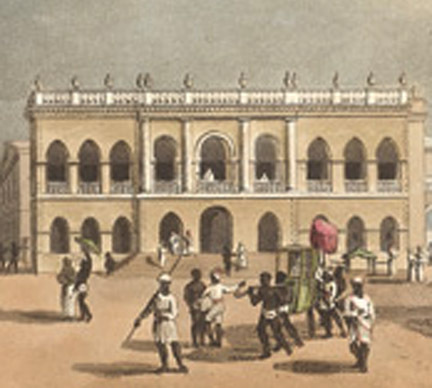 The Court House stood at the corner of Lalbazar and Mission Row. That site was occupied later by Martin Burn and Company’s Building. In 1732, the Mayor’s Court moved to the premises of Charity School, which was subsequently known as the Free School. As seen in the picture the Old Court House – the two storied building with its Ionic columns and an urn-topped balustrade – stands on the right. It occupied the site of St. Andrew’s Church by the side of the Writers’ Buildings. 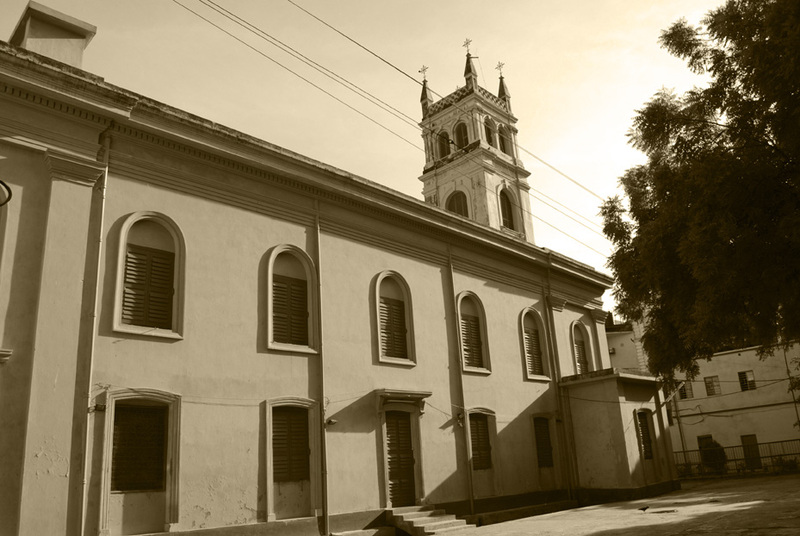 This building also served as the Town Hall of Calcutta at one time. See The Court House which Mr. Bourchier built was in 1762 greatly enlarged by the addition of verandahs, an additional saloon with a rooms as well as a dancing-saloon “in order that it might be used as an Exchange, Post Office, Quarter-Sessions Office, public entertainments, and Assembly rooms. For over thirty years the Old Court House was the scene of most of the public entertainments, and assembly balls. Towards the close of the century society had begun to break up into classes, subscription assemblies went out of fashion, and the old house became unsafe. The building was pull down in 1792. 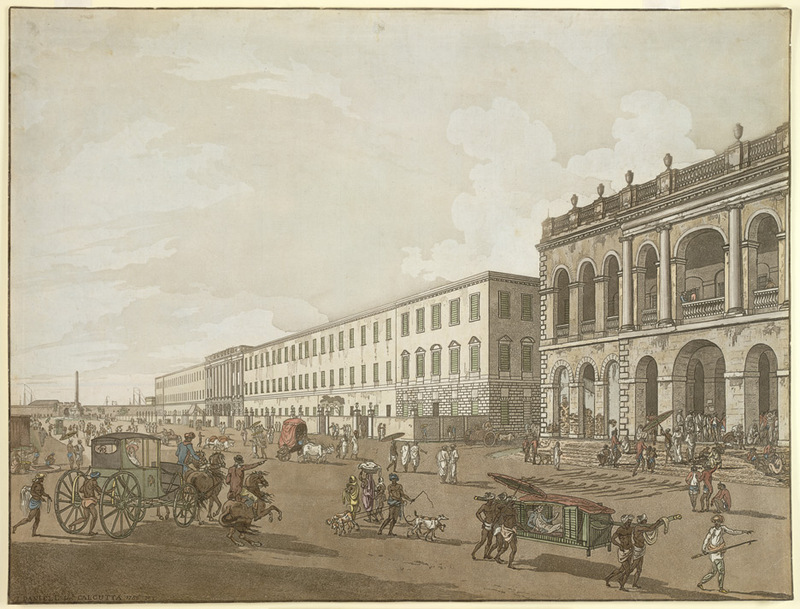 Coloured etching with aquatint of the Old Court House and Writers Buildings in Calcutta by Thomas Daniell (1749-1840) no. 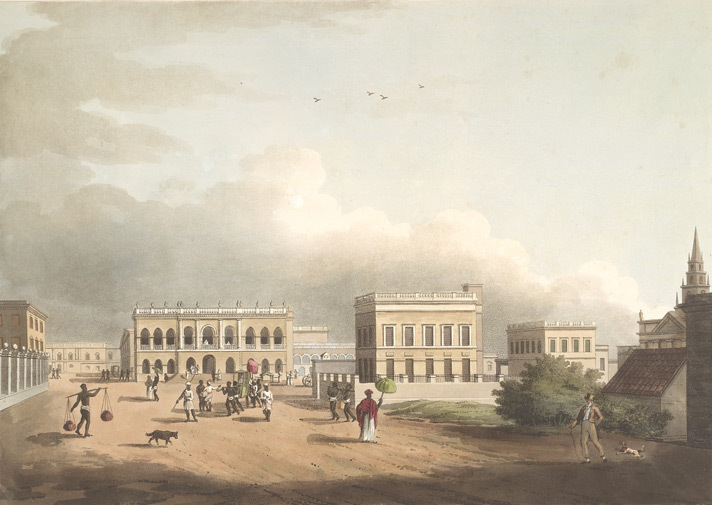 2 of his ‘Views of Calcutta’ published in 1786. This view is taken from the north side of Tank Square and looks towards the old Fort.